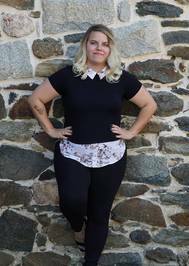 Lindsey R. Sablowski is a fantasy author who lives in Maryland with her boyfriend and cat. With the series complete, Lindsey works on new pro Lindsey R. Sablowski is a fantasy author who lives in Maryland with her boyfriend and cat. With the series complete, Lindsey works on new projects. Her newest release, Clara and Claire, is a fantasy/mystery novel, following Clara Nasso's story. To ask Lindsey R. Sablowski questions, please sign up. We’d love your help. Let us know what’s wrong with this preview of The Greatest Knight by Elizabeth Chadwick. Have you read Sweet Evil by Wendy Higgins yet?